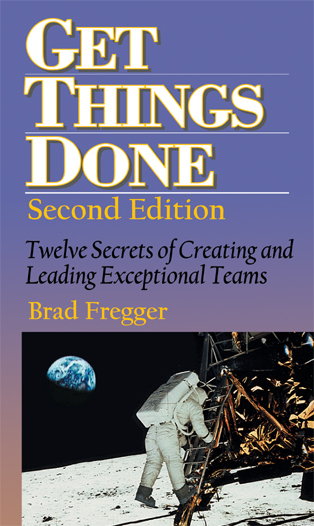 The first edition to Get Things Done was published16 years ago. During the intervening time Brad has taught many management courses internationally. The intensive teaching of these concepts forced him to clarify some of the secrets of effective leadership and even develop some surprisingly simple ones for what are considered to be very complex issues of management. This is why he believes this second edition is needed and will provide even more valuable information about effective leadership. In re-reading Get Things Done, I was surprised by how much of this information is of even greater value today than when I wrote it. Sixteen years ago there was still the feeling within many companies that the boss was the boss and employees should pretty much do as they were told. While most employees desired respect from their employer, wanted to feel valued, knew that they were critical members of a team doing something challenging and important, finding a workplace whose core values supported that was not all that easy. Today, many organizations realize the value of team players that are committed to the goals of the organization. And effective leaders that can create a workplace environment where this exists are highly valued and their contribution recognized and rewarded. These organizations realize that an effective leader who is able to get the right things done in the time needed and on budget, is worth their weight in gold. The problem is, there are very few schools or training programs that understand the characteristics that make up the effective leader; that have grasped that effective leadership is as much a talent as it is a skill. Some people have an inbred talent that can be honed to mastery. But most don’t have the talent needed to truly excel. However, with great desire, excellent training, and effective mentorship most will still be able to reach a skill level that will make a significant difference in the success of their team and, therefore, the organization. This book can be very valuable to those who will never be able to play with the finest orchestras, but can and will make a big difference to any organization they are a part of. The skills this book mentions are invaluable, but it can’t provide the talent that is needed to truly excel, to play Carnegie Hall. I’ve written this book especially for those who are intuitively excellent leaders, who have the personal characteristics, the inborn talent essential for the mastery of effective leadership techniques. Those who, with increased knowledge and enhanced skills, will be able to play with the pros and create environments where the impossible happens and the extremely difficult is handled with ease. This book will be an invaluable source for these individuals as they will be affirmed in their leadership skills and characteristics. They will become even better leaders, become true masters of the processes and characteristics that make someone truly an effective leader. Finally, this book is about organizational or small-team leadership. This book has not been written for the CEOs of Fortune 500 companies (although they would gain much by reading it). Most academic programs and the vast majority of leadership books are designed to prepare the individual to manage a major corporation. These books are about management, not leadership. This book is about leadership, not management, and is one of the extremely rare books with this individual, targeted focus. Personally, I believe that this is where the value is; very few of us become industry leaders but most of us will be managing small teams in a great variety of organizations doing the critical work of the organization. This is where true leadership shines; these are the people who will assure the success of the organization by getting things done, effectively, efficiently, and on time.